Been awhile since I’ve had a chance to review a Bourbon (since I was on a bender in the UK), so when I ended up having a relaxing day on Saturday, watching my new kitten play with my older kitten, it seemed like the best time. My one buddy who enjoys whisky as much as I do left a bottle of Wild Turkey 81 proof at my place, with the express instruction to review it when I had a chance.And who am I to let him down? 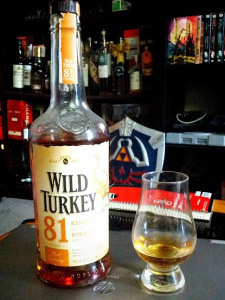 If you remember, I reviewed the Wild Turkey 101 proof , I was quite happy to find the 101 proof due to Canada’s wonderful (sarcasm) laws concerning taxes on proof and thus only the 81 proof being available here.